Known under its official nickname of North Star State and also often called the Land of 10,000 Lakes, Minnesota is the 12th biggest US state of them all. Well-known for its high living standards and a huge amount of lakes all around, Minnesota is a popular place for people to live and visit and also happens to be regarded as one of the most educated and richest states of all. It is located in the Upper Midwest part of the United States with borders to North Dakota, South Dakota, Michigan, Wisconsin, Iowa, and Canada. Minnesota is located entirely within the Central Time Zone. Minnesota's state capital is Saint Paul, a city of a little over 300,000 people, but the largest city in the state is Minneapolis, which has a population of over 420,000. Minneapolis and Saint Paul are located in very close proximity to each other and are often known under the nickname of 'Twin Cities.' Together, they form the Minneapolis-Saint Paul metropolitan area, the largest of its kind in the state of Minnesota, housing around 60% of the state's residents overall. Minnesota also happens to be the northernmost contiguous state in the entire US and boasts some impressive geology, home to some of the planet's oldest rock formations, rich forests, and more than 10 acres of lakes in total. The state has a continental climate that can vary quite a lot from one season to the next, with hot summers and very cold winters. 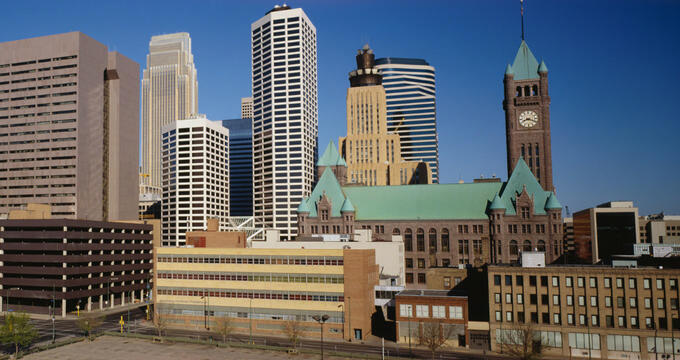 Minnesota has a wide range of industries, boasting one of the most diverse economies in the entire United States. Agriculture is a big part of Minnesota's economy, with the state being America's biggest producer of various products including turkeys, sweet corn, and sugar beets. Forestry and mining are also important to the state of Minnesota, along with more modern industries like tech development and biomedicine. Minnesota boasts a range of fine art museums and a thriving theater district, with the annual Minnesota Fringe Festival being one of the largest performing arts festivals in the whole of North America. Various famous musicians have also come from this state, including Bob Dylan and Prince, along with celebrated filmmakers, writers, actors, and more. Minnesota also boasts one of the most popular State Fairs in the entire US, attracting hundreds of thousands of visitors. The United States would have to wait until the late 19th century for proper time zones to be introduced. Up until that time, citizens would rely on the sun as their main method for telling the time; when the sun passed the meridian, cities, and towns would set their clocks to midday. This system was quickly deemed to be outdated as rail and telecommunications networks spread out across the nation, and a new system needed to be introduced. So, in November of 1883, four time zones were drawn up for the contiguous United States. The state of Minnesota was placed in the Central Time Zone alongside many other states, while others were added to the Eastern, Mountain, and Pacific Time Zones. All of the major cities in these zones were informed of their new standard times on November 18. The Central Time Zone (CT) covers all of the state of Minnesota, as well as applying in many other parts of the US and Central America too. CT comes in two varieties: Central Standard Time (CST) and Central Daylight Time (CDT). The standard version is six hours behind Coordinated Universal Time (UTC), while the daylight version is five hours behind UTC. Along with all of Minnesota, the Central Time Zone covers eight more states in their entirety, including Illinois and Wisconsin, as well as parts of 11 other states. The Central Time Zone is also used in the vast majority of Mexico, along with several Central American countries, the Caribbean Islands, and parts of Canada. The whole of MN, just like the vast majority of other US states, utilizes daylight savings time for several months of the year. This system was first introduced in 1966 with the Uniform Time Act but has since been amended and expanded after the Energy Policy Act of 2005. In Minnesota and other US states, daylight savings time begins on the second Sunday of March and runs through to the first Sunday of November. During this period each year, MN observes CDT rather than CST.